The Hailey City Council is thinking outside the box in order to regain public access to a one-mile stretch of cottonwood forest on the Big Wood River south of the city. A liaison from the council and the city attorney will soon begin working with developers, land trust officials and Blaine County to explore options to preserve public access to the area. In return, the city may have to annex about 22 acres of contiguous land on higher ground along Broadford Road for a 55-unit housing development. County zoning allows for 16 to 21 homes along Broadford Road. "We need to take leadership and at least try to figure out how to discuss this. If not, we will regret it for a long time," said Councilwoman Martha Burke. Burke was joined by Hailey Mayor Rick Davis and about 25 others who walked part of a historic trail on the 153-acre riverfront property between Heagle Park and Colorado Gulch on Monday. It was the first opportunity for the public to access the area since the landowner fenced it last year, threatening to have trespassers arrested. The popular hiking and biking area was fenced after the City Council denied landowners Jeff Pfaeffle and Grant Stevens an annexation request that would have brought a 94-unit development to 22 acres of bench property above the river along Broadford Road. The annexation would have left most of the riverfront off-limits to the public and allowed for construction of an estate-sized home near the river. In an about-face this summer, Stevens and Pfaeffle are now asking the city to work with them to establish public access to the land, which is listed for sale at $3.5 million. 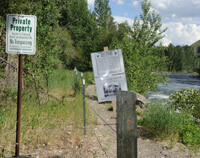 Pfaeffle said if the property remains in private ownership one of two estate-sized parcels along the river could be developed, and the entire 153 acres fenced forever. "Our goal is to remove it from private ownership forever," said Pfaeffle in an interview. To that end he is hoping the Wood River Land Trust, the Blaine County Open Space Levy Board and the city of Hailey will join forces to purchase and preserve public access to the riverfront property. Pfaeffle said he plans to apply in November for funding from the Blaine County Open Space Levy Board, which has raised $3.5 million from taxpayers, to secure open space and public access in Blaine County. He is also working with the Wood River Land Trust, which has raised about $1 million over the last 15 years for land acquisitions, including about $300,000 to secure the nearby half-mile long, 80-acre Draper Preserve on the Big Wood River in Hailey. Although there is no formal annexation application before the city, Pfaeffle told the City Council Monday that he would require the city to guarantee a density allowance of about 2.5 units per acre, the average housing density of the city of Hailey, in order to move forward with his plans. "The landowners would be able to offer the property for sale for much less if the city participates in the annexation," Pfaeffle said. Annexation would allow 55 housing units on the bench property, about three times the number allowed currently under county zoning. The council agreed unanimously Monday to provide a council member as liaison, and occasionally the city attorney, to attend meetings with the developer, the Blaine County Open Space Levy Board, the Wood River Land Trust and other organizations able to help with preserving public access to the riverfront property. The land trust has for several years managed a conservation easement on the riverfront property, which is in the floodplain and therefore undevelopable, except for the two estate-lot building envelopes. "It needs to be in public ownership," said Scott Boettger, executive director of the Wood River Land Trust, after touring the area on Monday. He said his organization would help raise funds to buy the property, if the city agrees to the annexation on the bench. "The more significant the property, the easier it is to raise money for it," he said. "It is unusual for the City Council to be involved at the beginning of this process," City Attorney Ned Williamson said at Monday's meeting. He said annexation requests, which typically mean increased density and tie-ins to city services, usually come as completed plans first to the Hailey Planning and Zoning Commission for deliberation. The city then usually judges the impact on the city of the proposed development, before assessing annexation fees. The chosen liaison from the council could be appointed within the next two weeks. Due to state laws, the chosen council member would be able to facilitate the exploration process, but not be able to vote on an actual annexation proposal when and if the time comes before the City Council, said Williamson. Several people spoke for and against the idea of annexing the bench property, but no one denied the value of maintaining public access to the riverfront property. Kathie and Darin Barfuss and William Miles, landowners whose property lies between the proposed development and the city, spoke against the proposed annexation. They would be force-annexed into the city under the plan. Doug Abromeit, Pam Ritzau and others spoke in favor of the annexation if it would serve to preserve access to the 153-acre riverfront property. Over the next few months, citizens of Hailey will have opportunities to comment on the proposal, and to follow the progress of talks between the city liaison and the other parties involved. "Having grown up here and watched public access disappear, I think that one mile of riverfront is significant, said Council Chairman Fritz Haemmerle. "I am all for access to this property."